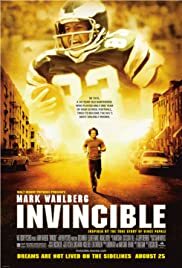 Mark Wahlberg gives a splendid performance as a former teacher and bartender who gets the chance of a life to play professional football with the Philadelphia Eagles. The trouble with this film is that is full of clichés. The team that has to have heart and soul. A brooding young man whose wife walks out on him and takes all the furniture as well. This same young man who is affected by teacher budget cuts with a hard-working class father whose wife has died following a lengthy illness. Greg Kinnear gives ample support as the coach who has a positive feeling about Wahlberg. (Vincent P) Despite early team failures, he keeps him on the team. We see what life is like in the training camps and how Wahlberg has heart to stay on the team and then take abuse from team mates. When Kinnear gives his rousing locker room speeches, I thought of Pat O'Brien asking his team to win this one for The Gipper. Yet, with all these clichés, the film is nicely done and is a tribute to the idea that if you persevere, you can succeed.